2 October 2014 proudly marks the 145th birth anniversary of Mahatma Gandhi respectively. His practice of ahimsa and righteousness; the path of practicing non violence and goodwill whether in thoughts, words or actions along with his admirable faith in the principles of truth and justice; evoking one another’s conscious awakening conscientiously to live their divine grace, divine purpose, divine principles, divine values, divine vision, divine wisdom and divine will have transformed the landscapes and visions of millions of lives amazingly. Today, as we stand at the cross roads of time, there are numerous important lessons that could be learned from his noble and wise approach to the gracefulness of life. History is testament to his remarkable achievements. Mahatma Gandhi relentlessly sought to endorse his affirmative pledge in the impeccable credentials of the truth that consistently exemplifies and governs the hallmarks of timelessness posthumously. He embraced the completeness of life by being true to his ideals, nature, purpose, principles and values. When we are true to the nature of our living then life is likewise true to the nature of its giving as well. Let us seek to earnestly come together to sustainably empower the visions that belongs to the goodwill, harmony and welfare of the Universe. 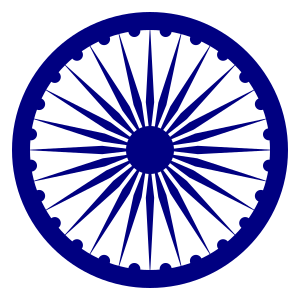 Mahatma Gandhi through the chakra (spinning wheel) spun forth a vision that encompassed the wheel and divine will of consciousness that further blossomed forth its evolutionary harvest of bringing to fruition the cherished aspirations and hopes of millions of people, God bless. Remember, this intuitive divine will and wheel of consciousness is prevalent in each and every form of God’s creations amazingly; those who endeavor to harness their synergistic potential by utilizing their pure intent towards adopting their life’s resolutions tend to affiliate themselves with the universal power of abundant energy of goodness and goodwill that prevails ever since time immemorial, and will continue to do so, right across, from infinity to eternity nobly. Realize that our intellectual powers have been granted to us for a divine purpose, which is to ensure that we live our dharma (duties) to fulfill our karma (deeds) sacredly and devotionally; whatever we do, we do our very best and with utmost commitment, ensuring that it brings forth greater goodness and spreads the goodwill of joyfulness and progress for one and all unanimously, for this vision is the vision that encompasses all vision because it concerns and connects with each and every element of nature and the universe from an intention of contribution towards the harmonious welfare of the world as one happy family; we may have heard the slogan, vasudhaiva kutumbakam whose translation definition is; the world is my family; the world is our family, Gold bless. The above humbly inspires us to creatively invest our precious time in endeavors that could constructively contribute towards our and others well being characteristically as well as ingeniously. Each and everyone of us have been gifted with numerous characteristical qualities and virtues of magnificently creative endowments. We need to graciously and gratuitously acknowledge the wealth of the priceless virtues that remain ensconced within our true nature, true self and our divine essence remarkably, thereby harmoniously aligning+integrating and orientating with meticulous calibration as well as precision across each and every moment of our lives very most diligently, meaningfully, prudently, resourcefully, responsibly, sincerely, truly, sincerely and wisely in the committed service of the goodwill, harmony and welfare of the Universe infinitely, God bless. The Peoples Republic of China annually celebrates its National Day on 1 October respectively. When we reflect upon the greatness of The Peoples Republic of China, we are inspired by its motto, “Gung Ho”. ; the translational definition of this is “Work Together, Work In Harmony”. Working together with a universal perspective aimed upon fostering, nurturing and sustaining the visions that belong to the goodwill, harmony and welfare of the world reflects the crowning grace of humanity’s remarkable progress and success; while working harmoniously refers to the amazing cultural ambition, aspiration, attitude, brilliance, courage, creativity, enthusiasm, excellence, foresight, greatness, gracefulness, dedication, magnificence, patriotism, pride, progress, unity, wonderfulness and wisdom of the Chinese nation and its admirably talented people always, God bless. When some elements are missing in our lives, certain ailments resurface? (there truly is never any element missing, it is our conscious realization of what we seek that will help manifest and unfold it in our lives; this is truly so because we are all complete as souls filled with the divine radiance, purity and truth of our being which we must realize to experience, accept to radiate and express to immerse ourselves in the pure nectar of the eternal truth which always seeks goodness and wellness for one and all) Actually, it might be certain beliefs, habits, emotional tendencies and mannerisms that might be strongly affecting and influencing rather than the disappearance or re emergence of elements. Sometimes it is what did we drive away and yet again in the very same contexts, it is what we drive our way (attraction; pure intent is what manifests and without realizing we maybe calling upon various aspects to unfold and manifest, whether it maybe the most simplest or the most complex, for the universal consciousness, it is the pureness of the intent in its goodwill for the welfare of one and all that ultimately prevails and reigns incessantly). Elements are by themselves neutral and do have their consciousness which seeks to align with our higher consciousness in regulating the conformance of our being. Being consciously aware, we opt and make certain set of choices in how we feel about ourselves and others and many a time in the feeling intensity, we augment our composition, our opposition or our supposition. Hence, depending upon what we attribute towards what else, what may never have existed surreptitiously evolves and strangely persists and mutates itself. Remember the saying that what we resist, persists all the more, so here whether for or against, likewise set of factors unfold with their contagion of sentimental elementalities. We may have heard of athletes and various personalities recovering from life challenging diseases phenomenally. Also, we may have noticed how some individuals are exceptionally brilliant and innovative in what they aspire to create. What is the key ingredient in each and everyone that unfolds is that each and every individual however they were thought well of the goodwill, harmony and welfare of the collective consciousness. They shared a universal affinity with the universe remarkably well, realizing that the origin and source of all emanated from the pure grace of existence and all they intuitively did was to earnestly reach across into that reservoir of abundance and pledged with a dedicated commitment to do something constructive and progressive for the well being of themselves and others compassionately. They eternalized life and triumphed for their internalization acquired and developed an attitude of shining instead of shunning; of acknowledging instead of just acting knowledgeable; of replenishing far much more into the echelons of the universal realms by contributing deservingly and meritoriously towards their evolutionary growth in grace and wisdom, for when they knew that in order to achieve, they had to first of all establish a state of equilibrium by achieving true order by the process of self realization. So in a nutshell, if someone keeps discussing and repeatedly speaking only about disease and poverty and hatred, all that they accumulate becomes the likewise set of consciousness (we are either electing or selecting in both the acceptance as well in the denial and attract, augment, intensify and manifest likewise set of circumstances and factors to thereby evolve in our lives). Whereas, when they conversely seek to lead a positive lifestyle despite the odds and ensure they are doing what it takes and needs to be done resourcefully, they thereby accelerate the process of enhancing the scope of their visions to align with the universal envisioning for all they seek is pure and true in its essence and belongs to the goodwill and progress of one and all. There comes a third set of situation where despite practicing positiveness, some individuals keep experiencing the harsh ordeals of life and wonder if all this is only their karmic accountability seeking retribution? They helplessly vacillate along the corridors of one aspect to another, embracing divergent sets of beliefs, practices, habitualness and mannerisms and eventually succumb to a paradox of confounding statements that they keep resonating, not knowing whether one choice or another could luckily bring them greater accomplishments or progress? They remain undecided and easily provoked by even the smallest of pretexts and thereby keep remaining in the stage and state that is in between varying predicaments, but for how long? and for how wrong? They innocently keep looking for some glimmer of hope, wishing that aspects and matters would unfold and develop by themselves, but the factor of luck is actually what one makes of it, so through one’s conscious set of choices, one improves one’s well being and a disciplined and committed approach that is faithful to the core goes a long way in gradually helping to make things fall in their respective places and spheres, but the matter of calmness, patience and serene wisdom are truly priceless and extremely essential and vital ingredients that help fortify and strengthen one another’s lives remarkably well. Let us put everything in one frame of simplified understanding which is. We are all either in the process of developing or enveloping our choices and then face likewise set of eventualities; it is consciousness all along, if we state at play, it humbly refers to at ply; applying; applicability for consciousness is that which as it expands and raises when we meditate, brings us a greater set of realizations where we perceive the same or similar set of aspects from a mature perspective. We realize that what we thought was taught we what after all and keep endurably venturing ahead with a determined attitude to create greater good for humanity as well as all of God’s creations, for then it is thinking as a soul and being in divine union with all that was, is or will ever be for the goodwill, harmony and welfare of the universe infinitely, God bless. Think well, it matters. Do well, it matters too. True will, divine courage, divine vision and divine will; for it is all that matters that matters after all, God bless. Do what’s right, for righteousness is what life is all about, God bless. Sometimes, we wish we could speak to God. God wishes we could summon time’s true speech, God bless. Try to avoid? Void, truth tries. Tries refers to the trial, the judgment and the accountability factor. Remember time tries truth as well as time is tied to the truth for truth is the root of all that was, is and will ever be. The captioned title refers to the impartiality of truth, since truth does not divide or segregate, its pureness shines forth across the landscape of time integrally with utmost integrity. Trust in the truth exemplifies the divine essence of our lives and practice of righteousness in all that we think do, express and implement subjectifies the evolutionary growth in grace and wisdom right across our lives, God bless.